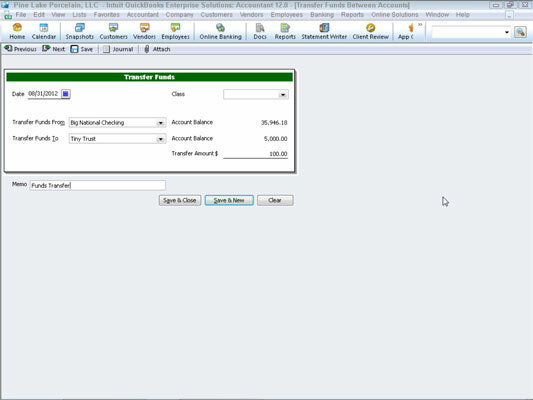 The QuickBooks 2012 Banking menu supplies a useful command for transferring money between bank accounts. To transfer money between accounts, you can choose the Banking→Transfer Funds command. When you do so, QuickBooks displays the Transfer Funds Between Accounts window. Use the Date field to identify the transfer date. You can enter the date in mm/dd/yyyy format, or you can click the small calendar button that appears to the right of the Date field. When QuickBooks displays the calendar, click the day that corresponds to the date you want to enter into the Date field. Use the Transfer Funds From drop-down list to select the bank account from which you’re moving funds. You can enter the bank account name into the box, or you can click the drop-down arrow at the right end of the box and select a bank account from the list that QuickBooks supplies. Use the Transfer Funds To drop-down list to identify the bank account that receives the transferred funds. The Transfer Funds To box works like the Transfer Funds From box. Use the Transfer Amount box to identify the amount of the transfer. For example, if you transfer $1 from your checking to your savings account, the transfer amount is $1. (Optional) Provide a memo description for the transfer transaction. If you want (and this is no big deal), you can use the Memo box to provide some brief memo description of the funds transfer. To save your transfer transaction, click either the Save & Close or the Save & New button. Alternatively, if you don’t want to save the transfer transaction, click the Clear button.